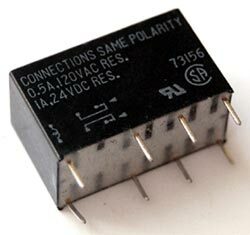 Series T85 relays are ultra sensitive through 48 volts. Their DIP configuration mates with 16-pin socket. Bifurcated contacts are in a 2 Form C arrangement. The plastic sealed case allows immersion cleaning. Operate Time(excluding bounce): 6ms max. Release Time(excluding bounce): 3ms max. Between Open Contacts: 500V rms, 50/60 Hz for 1 min. Electrical: 500,000 @ 1A, 24Vdc res. ; 200,000 @ 0.5A, 120Vac res.